"Sonlight has been a lifesaver for us, especially being fairly new to homeschooling," writes Lori P of Surprise, AZ. "The complete lesson plans made it so easy to put together the year with Lily's History/Bible/Literature program, along with the ability to match her Language Arts to her level. We were able to build her entire curriculum by adding in Math and Science, which she loves to do outside with Finn by her side. Thank you Sonlight!" Here, Lily (9) works on her math as she enjoys the beautiful weather and the freedom to work in a relaxed environment, shoes off! 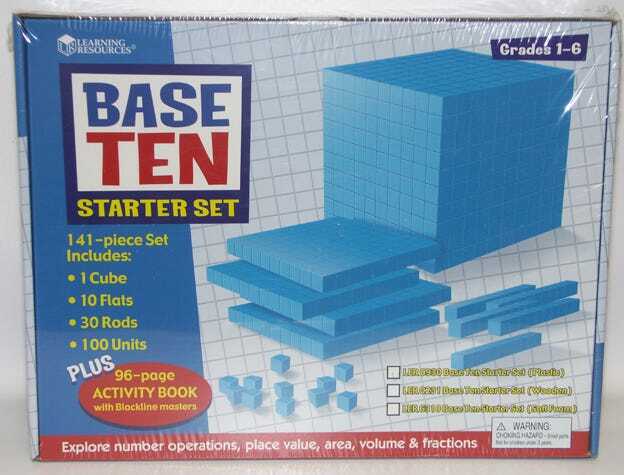 Manipulatives, instructions and teaching notes for learning about Base Ten. This set includes 100 one centimeter cubes, 30 rods (composed of ten cubes to represent the tens' place), 10 flats (composed of 100 cubes to represent the hundreds' place), one cube (composed of 1,000 cubes to represent the thousands' place), plus a copy of Base Ten Blocks Activities, a 96-page reproducible book that explores number operations, place value, area, volume and fractions. Also comes with teaching notes. Please note that the 100 centimeter cubes do not have a mass of 1 gram or displace the equivalent volume, so they cannot be used in place of gram blocks.